Foam roofs have many benefits that make them perfect for Scottsdale homes and businesses. These roofs are installed by spraying on a liquid foam that dries to a hard layer. That foam layer is then coated with an acrylic layer that provides protection. Properly applied, foam roofs can last 100 years or more, and they require very little maintenance. Shingle can peel off or blow away, and tile can break. Foam roofs provide consistent protection so long as the top layer is maintained. Problems occur when the top layer is damaged and UV rays and water are allowed to penetrate the lower layers. Getting regular inspections will help you identify when foam roof repair is needed early so that the problems are not given time to get bigger. First Class Foam Roofing and Coating offers the expert repair needed to keep your foam roofing in top condition to protect your property and your bottom line. Some of these issues can be caused by wear and tear from constant UV exposure and from heavy rains and debris. However, some of these issues can also be caused by poor workmanship or low-quality materials used when the roof is installed. The professionals at First Class Foam Roofing and Coating use high-quality materials and craftsmanship when we install foam roofing or repair it. We can diagnose any existing issues and perform complete repairs so that your property is protected and your roof will have a longer life. Your foam roofing is an important investment, and you need to hire the right roofing contractor to protect it. 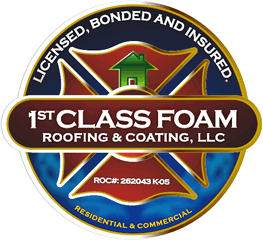 First Class Foam Roofing and Coating takes that responsibility seriously, and we are committed to providing the very best customer service and the highest quality of craftsmanship and materials. Whether we are just answering questions about our hours when you call or we are talking you through issues with your roof, our contractors will answer all questions thoroughly with patience and courtesy. We want to build long-term relationships with our customers so they are part of our roofing family. Call us today to make an appointment for a foam roofing inspection in Scottsdale. We'll make sure that your roof is in top shape, and if it's not, we'll let you know what kind of foam roof repairs are needed to protect your investment.